Bike carrier towbar - A towbar to transport your bikes. Brink has expanded and renewed their range of bike carrier tow bars. You can now choose between a fixed bike carrier towbar and two types of detachable ones. We are glad to help you select the right towbar for your electric or hybrid car. Due to a lack of power, overload of the battery pack or exceeding the CO2 emission standards, manufacturers will not allow most environment-friendly cars to tow trailer weight. However, when it comes to vertical carrying capacity, that’s a different story. Given this, Brink has developed a towbar that will only allow you to carry things but not to tow things. 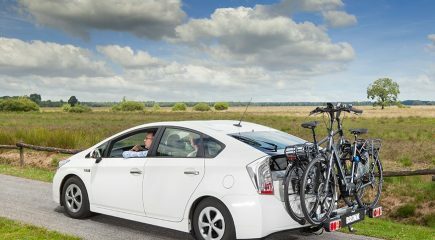 This means you can still take your bike with you even if you have an electric or hybrid car, as almost all bike carriers can be mounted on the Brink carrying solution. In order to ensure that you really only use it for carrying a bike carrier, we attached a safety mechanism on the ball of the towbar. A small strip on the top ensures that no towed object can be connected to the ball of the bike carrier towbar. Today we have developed a new system that makes it impossible to attach a trailer, caravan, boat trailer or horsebox to the bike carrier towbar. We now anchor a pin through the ball of the towbar, as replacement of the strip on top. At first, Brink only released one type of bike carrier towbar: a diagonal detachable towbar. A perfect system if you are looking for a towbar that is extremely user-friendly. In no other detachable system is it as easy and effortless to unlock and lock the ball. As added advantage, the sleeve of the towbar remains largely invisible after the ball is removed and the socket can be folded back behind the bumper. Bent u op zoek naar een trekhaak voor uw auto die na gebruik volledig onzichtbaar te maken is? Dan is er nu ook de verticaal afneembare fietsendragertrekhaak als dé oplossing. De huls waar u de kogel in vergrendelt zit verborgen achter de bumper en de stekkerdoos is achter de bumper weg te draaien. 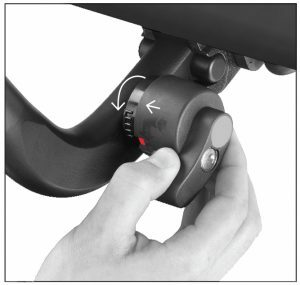 The dial on the ball of the diagonal and vertical detachable towbar both have an ergonomic design. The dial is comfortable to use as your fingers, hand, wrist and arm are in a natural position when twisting it. Because of this, you can ensure an optimal power transmission with a minimal exertion of force when unlocking the towbar. Unlocking the ball of the detachable bike carrier towbar is a quick and easy affair. This dial has arrows that show the two consecutive actions needed for unlocking the system. Do you often take your bike for a spin? Then our collection also offers a fixed bike carrier towbar. This is permanently available, maintenance-free and will last the lifetime of your car. The fixed bike carrier towbar is almost certainly available for your car, as we have developed a fixed towbar for almost any make and model of environmental-friendly cars. The only time this type of towbar is unattainable is if the fixed bike carrier towbar blocks your license plate or mist lights, as these are legally required to be visible. A fixed bike carrier towbar has the most reasonable price of all bike carrier towbars and in most cases is suitable for cars that have the Park Distance Control system (PDC). All Brink bike carrier towbars have been developed in such a way that they can handle the maximum vertical axle load, called nose weight, of your car. When transporting your bikes, please keep the maximum nose weight of your selected bike carrier towbar in mind. The total weight of the bikes and carrier together may not exceed the maximum nose weight. The maximum nose weight is usually listed on the plate next to the socket of your towbar. A nose weight that exceeds the maximum limit due to excess weight results in undue taxation of the car’s suspension and towbar mount. In addition, it negatively influences the driving capabilities and power steering. Do you have an electric or hybrid car that is not allowed to tow and would you like to use a bike carrier? Then Brink offers you the solution; the bike carrier towbar. Brink continuously develops new models, and the design of the bike carrier towbar has been renewed. The advantage of this is that more types of bike carriers fit on the new system. In this blog you can learn why the bike carrier towbar, the RMC, has been developed and you’ll find out which bike carriers fit this system.